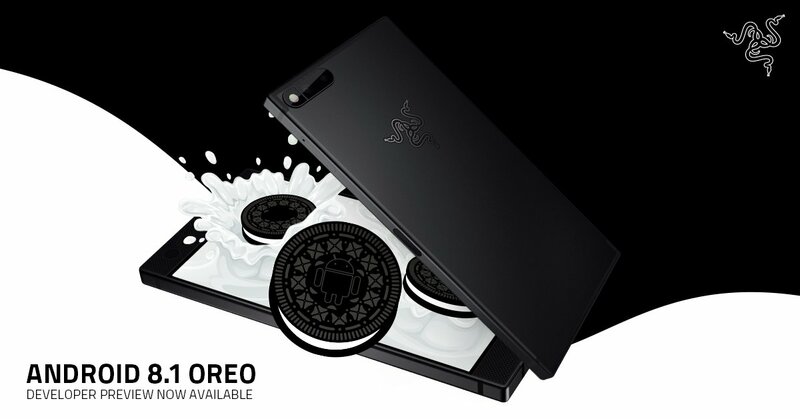 Oreo 8.1 Developer Preview Released For Razer Phone, Stabke Update To Be Rolled Out By April - AndroGuider | One Stop For The Techy You! When the Razer Phone was launched in November of last year, Android Oreo had been out for three months. Many expected Razer's smartphone to run the latest Android, but that didn't happen and Razer shipped its phone with Nougat 7.1.1. After seven months of the public release of Android Oreo, Razer Phone owners can now try out Oreo on their smartphone. Earlier today Razer released the first Android 8.1 developer preview for the Razer Phone. Razer Phone owners who choose to proceed with installing the developer preview will first have to unlock the bootloader of their device. This will void the warranty, and the phone will perform a factory reset after the bootloader is unlocked. Additionally, Razer Support will not entertain any queries from users who are trying out the developer preview. Razer has said that the carrier locked users can install the Android 8.1 beta build, but since there aren't any carrier related optimizations, users may face troubles in the form of network connectivity, and functionalities such as VoLTE, WiFi calling not working. Moreover, the developer build doesn't pass the SafetyNet check, which means you won't be able to use services such as Google Pay. The Oreo beta build has the build number OPM1.171019.011-RZR-180326.4044 and it consists of the February 5 security patch. You can install the developer preview by following the instructions from here. Razer has stated that the users who will install the beta build will neither get the stable Oreo update nor updates to subsequent developer builds, if any. Beta build users will have to keep an eye out for newer releases, and flash the updates manually when they are out. Moving back to the stable build will erase all data, which means all of your contacts, messages and applications will be deleted. To flash the developer build, you would be needing a "USB 3 Type-A to Type-C spec-compliant cable." The in-box USB Type-C to Type-C is only meant for charging purposes and hence cannot be used for flashing. On its support page, Razer has provided a link to Google Chromebook engineer Benson Leung's reviews of USB Type-C cables. Razer expects users to go through Leung's reviews and choose a cable for themselves. Razer plans to roll out the stable Oreo 8.1 update by mid to late April.